You could question whether the kid in this GIF intentionally walked into the wall or not, but it ended up being one of the best photo-bombs we’ve seen in ages regardless. 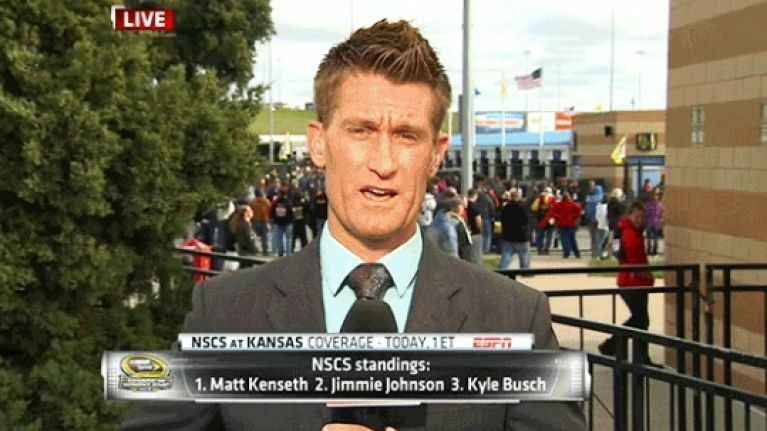 ESPN’s Marty Smith was reporting live from the NASCAR Sprint Cup Series in Kansas at the weekend and was spotted doing by so a young lad in a red jacket, who spotted his big opportunity to make a name for himself and the potential to brag about his hilarious appearance on the small screen. His cameo was certainly hilarious alright but for all the wrong reasons as in his attempts to get his mug on the camera, he forgot to look where he was going and ended up walking straight into a wall in front of him. On reflection, you could smell a rat and say that the collision with the wall was a bit too staged-looking to be entirely unintentional and no doubt the lad himself will try and claim just that in order to avoid coming across as completely foolish. It still gave us a laugh regardless.